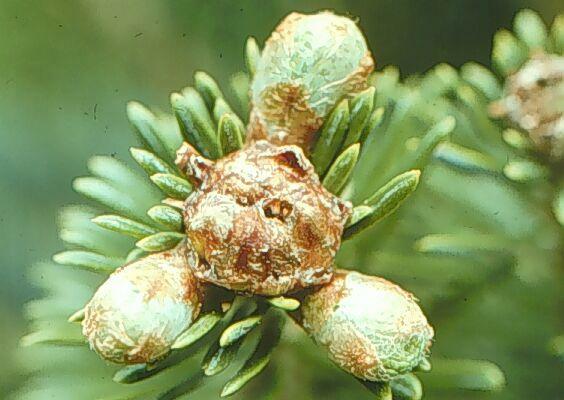 Rosette buds are Fraser fir buds deformed by the feeding of an eriophyid mite called the rosette bud mite (Tricetacus fraseri). Rosette buds are larger than normal and have a rounded rather than pointed tip. Often the buds are also darker and redder. Rosette buds are typically the terminal bud on a shoot and are most common in the lower portion of the tree. Rosette buds either do not break and grow in the spring or break to form multiple, weakened shoots. The reason the buds do not break is because the mite feeding has caused a cavity to form where next year's bud should have been. This cavity provides a home for as many as 3,000 mites through the summer, fall and winter. In spring these mites are released from the bud to form rosette buds for the next growing season. Rosette buds affect the quality of Fraser firs grown for Christmas trees. Damaged trees have gaps, flat sides, weak bottoms, and uneven and/or light density caused by the rosette buds failing to break and grow. These defects reduce the grade and value of the tree, and increase production costs because it takes longer to produce a tree of the desired height and density. Figure 1. Drawing of an eriophyid mite. To see rosette bud mites well, you need a hand lens or a microscope. Figure 2. The center bud is a rosette bud. Eriophyid mites such as the rosette bud mite and hemlock rust mite are biologically different from spider mites. They have four legs at maturity rather than eight. Their bodies are extremely small, requiring a hand lens or microscope to see them well, and are wedge-shaped rather than rounded. Eriophyid mites are broken into two groups: those that live on the surfaces of plants such as the hemlock rust mite, and those that require shelter to survive, such as the rosette bud mite. Rosette buds mites are vulnerable to the elements when they leave the protection of their old bud in the spring. Their success at forming new rosette buds is enhanced by humid, rainy conditions. Spread increases during wet springs and decreases during dry springs. Rosette buds are more common at higher elevations, and in certain counties, especially Avery County, North Carolina, and Grayson County, Virginia, although rosette buds are found in almost all counties where Fraser firs are grown. Rosette buds are also found in all the natural stands of Fraser fir. Rosette buds do not spread quickly. The mites themselves can only move passively - either falling down from one bud to buds forming below or being windblown to adjacent trees. Therefore, it can take two to three years from the time rosette bud mites are introduced into a field to when rosette buds are common enough to cause economic loss. However, the incidence of rosette buds has been observed to increase from 20% of the trees to 60% of the trees and from just two or three deformed buds on an individual tree to hundreds in a single year. The feeding of the rosette bud mite on the top of the expanding shoot tissue causes the bud distortion. Mites begin feeding at the base of the tiny needles at the tip of the expanding bud. This tip is the growing point of the shoot and will form the bud for next year's shoot growth. The mites work their way into the bud's growing point. As bud scales form, the mites are enclosed in the developing bud where they are protected from the environment. The mites continue to feed and start to reproduce. By June a cavity begins to form between the bud scales and next year's developing bud. The bud slowly disappears as the mites fill the cavity. It is thought that the mites' feeding alters plant growth, causing the rosette bud to form. By August, rosette buds can be distinguished from healthy buds. Rosette bud mites require an integrated pest management approach by combining scouting, cultural controls, and sometimes pesticide applications to minimize economic losses from this pest. Check with your county extension agent or local growers to learn if rosette buds are prevalent in your area. Keep an eye out for rosette buds in your trees. No special scouting is necessary until the first rosette buds are found in a field. If rosette buds are found, it is then necessary to determine if there are enough rosette buds to require a pesticide treatment. Pesticides control rosette buds for the following growing season and only help the tree if they break bud and grow. Therefore, if trees will be harvested in the current or next season, chemical treatment really doesn't help. Chemical treatments are most cost effective when applied to young trees several years from market. Chemical treatments are also not necessary if there are not enough distorted buds to cause an economically significant decrease in growth. The entire field should be assessed to give an unbiased estimate of the percentage of rosette bud infested trees. The decision to treat can be made the fall prior to treatment. Scout any time from August to April by walking several rows spaced throughout the field. Keep count of the total number of trees in the adjacent rows on a handcounter. Keep count of the number of trees having rosette buds in your head or on another counter. Dividing the number of infested trees by the total number of trees scouted and multiplying by 100 will give the percentage. To get a quick assessment, it is only necessary to view the trees from the direction walked. A good rule of thumb is to treat with a pesticide if 10% or more of the trees are infested. This is only a guideline. Your own needs should determine a treatment threshold. Yearly assessments are necessary. Don't Interplant. The sooner in the rotation that rosette bud mites infest a tree, the more they will affect tree growth. Interplanting allows the rosette bud mites from older heavily infested trees to infest young trees as much as 2-3 years sooner than they would if young trees were planted in a separate block. Therefore, if rosette buds are present in a field, harvest the entire block before replanting. Maintain Good Fertility. Trees grown on good soil with good, balanced nutrition don't exhibit the effects of the rosette buds as badly because they are producing more buds to mask the damaged ones. Regular soil sampling is essential for determining the best fertilizer mix for fields with rosette buds. Taking plant tissue samples will help target key nutrients such as phosphorus that support bud formation. Shearing Practices. Shearing early in the summer encourages bud development, thereby improving tree density and appearance even if rosette buds are present. Many growers have tried to shear heavily to remove rosette buds. However, lighter than normal shearing leaves more healthy buds and produces better tree quality. Early Harvest. Trees heavily infested with rosette buds should be harvested. Nothing is gained by leaving these trees to grow year after year. The quality of infested trees is hard to improve, even with good chemical control and proper nutrition. Heavily infested trees will also act as a source for re-infestation after chemical control, since no chemical control kills 100% of the mites. Some growers have avoided chemical controls altogether by harvesting these problem trees the year they are observed, even if the trees are small. Rosette bud mites are difficult to kill inside the tree. The most vulnerable period for the mites is when they are moving from the old buds into the newly breaking shoots. The problem is that Fraser fir trees break bud over a 3-4 week period so a single application of most pesticides is not effective. Two treatments two weeks apart are usually necessary for products such as Sevin. To date, the only a few pesticides have proven effective against rosette bud mites with a single application. These include Dimethoate, Movento, and Mavrik. Dimethoate and Mavrik are applied after all the trees have broken bud. The earliest breaking trees may have growth out 2 to 4 inches. Treatments made too late are ineffective because the chemicals cannot penetrate into the plant's hardened tissues to reach the mites. Movento should be applied earlier in the year, in mid-April, to achieve the same results. Movento, being a better systemic and slower to act, should be applied before budbreak. Good coverage is essential for good rosette bud mite control, especially with Dimethoate and Mavrik. Use a high-pressure hydraulic sprayer with a hand-held gun. Trees should be sprayed from two opposing sides using a heavy fog pattern, as opposed to the straight stream pattern commonly used for balsam woolly adelgid control. From 300 to 500 gallons per acre are required depending on the spacing, height, and density of the trees. Complete coverage of the most current growth is required for control. Applications using a mistblower have been more effective with Movento but still require excellent coverage and at least 50 gallons per acre. Do not add spreader/stickers or fertilizers. Do not spray when the sum of the temperature plus humidity is greater than 140. Use less than 200 psi pressure. Avoid a straight stream nozzle pattern. These materials kill the mites after they have already started to feed and to affect how the developing bud will grow. Because of this, distorted buds can appear on trees that have been treated successfully. More of these buds will appear the later that trees are treated. However, live mites will not be present in these buds, and there will be a healthy shoot that will grow the following season. It is only the bud scales surrounding the shoot that are distorted. Examination with a handlens or under a microscope is required to determine if mites are present. Retreatment the following year may not be necessary if control was adequate, or if trees are nearing harvest. Consult your county cooperative extension agent to determine if trees need to be retreated. Often only a single pesticide application is required in a rotation to give adequate control. The May / June application of Dimethoate and Mavrik to control rosette buds can also control the balsam twig aphid. The twig aphid actively feeding and reproducing through May and is laying eggs in June. When trees are successfully treated for rosette bud mites, twig aphids are also killed and no eggs are produced. The following spring, balsam twig aphid treatments can typically be skipped. Check with your local cooperative extension agent to help make the assessments. The elongate hemlock scale can also be controlled in June as crawlers of the scale are moving onto the new growth at that time.